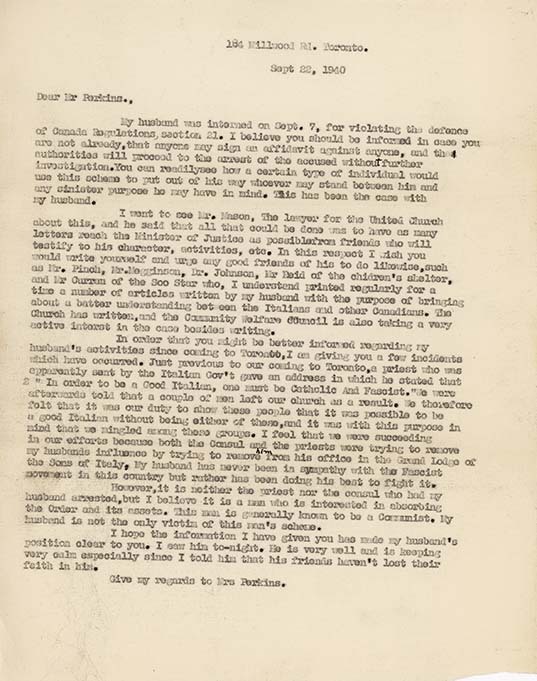 Letter from C. Sauro to Mr. Perkins, September 22, 1940. In this letter, Clementina refers to the belief at the time that many men had been singled out for arrest by informants. There is supporting evidence. The motivations of community informants varied, but it would appear that some did so for personal reasons. She does not name the priest and communist referenced in the letter, and not enough information is provided to pinpoint their identities. There have been accusations that Antonio Spada, a known communist, was an informer. An active member of the Order Sons of Italy, he was involved in the schism in that organization in Quebec which resulted in the formation of the Order of Italian Canadians. Spada himself denied that he ever acted in such a capacity.